There are various ways to use Pdanet. I use USB Tether on my Phone. How it works is that you will connect a USB from your Phone to PC and then use VPN APP Internet access on your PC. In this case, we will be utilizing USB for this tutorial. 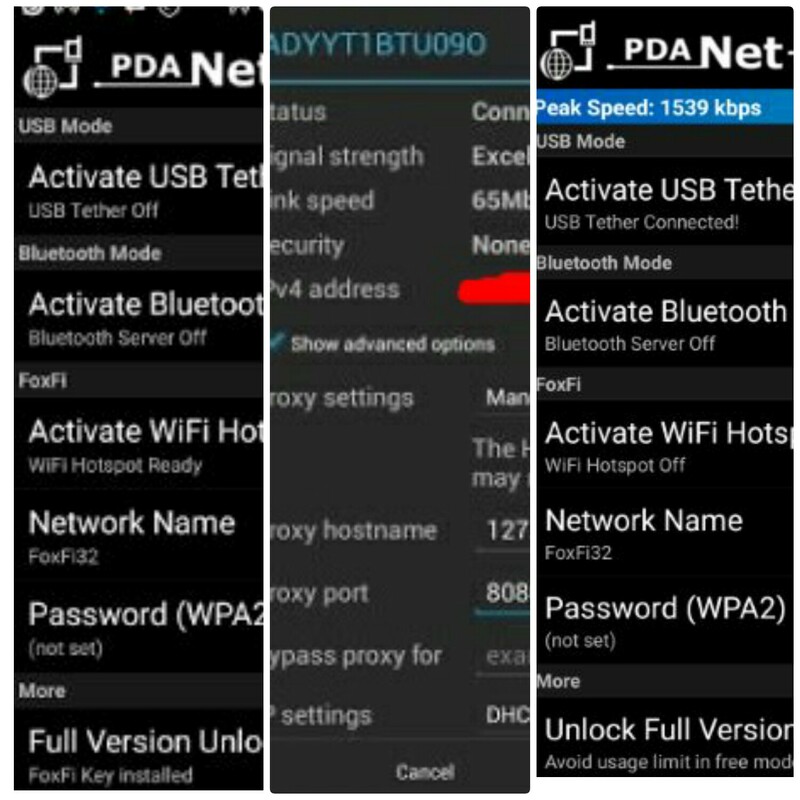 >>> Tap on USB Tether on your Android from Pdanet. >>> Now your Pdanet will be connected and you can now browse with any VPN data from your Android to PC. (If your PC doesn't detect your USB, make sure you enable USB debugging on developers option). This is how you can power all apps with your MTN - AIRTEL - GLO - 9MOBILE Unlimited Free browsing on PC. Please share this MTN Free Internet with friends and bloggers, please leave credits here. Enjoy free internet ones again from Free Browsing Network! >>> Now, share hotspot from your phone to your Mac/PC. >>> Connect your VPN app. >>> Open TetherNet app and tap on VPN because we are using a VPN connection. >>> Tap on Hotspot because we are sharing the connection via Hotspot. >>> Finally, tap on Start Connection. You'll get a popup message " Connection Share Through AP Hotspot "
Now, start browsing in full speed on your PC. It powers the whole PC. 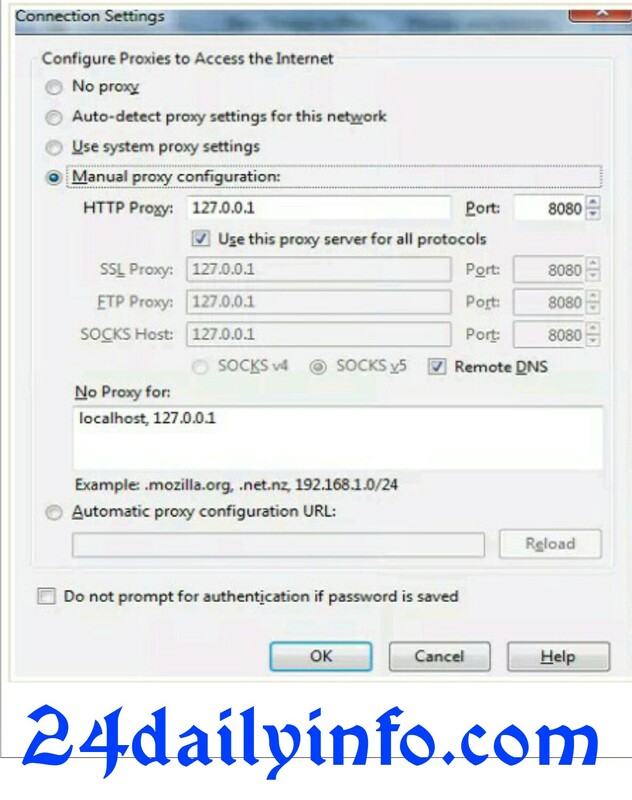 You don't need to set any Proxy on any browser. Just leave it at Default "Automatically Detect Settings". for Android users to Enjoy. get it activated on your PC. The newly released Windows 10. Simple Server Settings For 9MOBILE 0.00kb Free Browsing On PC. 1. Make sure your VPN is connected with either your MTN Free Browsing with N0.0 or Mtn Bis or Etisalat Magic Tweak or Etisalat social me/chat pak tweak etc. 2. Create a Wi-Fi hotspot on the main (primary) phone. Use default (set your WiFi security to none or default). 3. Now go to the other phone/device (secondary) and switch on the Wi-Fi to start searching for available network. 4. When connected, long press on the connected network name and then tap on “Modify Network”. 5. On the next screen, tap on the “Show Advanced Options” check box to open full settings. 2. Make sure your Hotspot is switched off to start with. 3. Run the installed PDANet+ app on your Android. Note that to share the connection with a PC, you have to download the pdanet.exe file for PC. 5. Make sure you Enable USB debugging on your Android from the “Developer Options”. 6. Tap and Activate the “USB Tether” option for best reliability and connect your USB cable to the PC. 7. Install the PDANet+ for PC (if not already installed) and confirm that it is connected to the phone. READ ALSO: Check Out Windows 10 Free Upgrades Expiring Date: Free Upgrades to Windows 10 End Soon! If you don't want to use USB cable you can also connect your pdanet+ via WiFi Hotspot, but it's better to crack PdaNet+ in order to enjoy the full version. 2. Then open your Pdanet+ and mark Activate WiFi Hotspot. Then turn ON your PC Wifi and search for available wireless and you will detect FoxFi33. Connect it and enjoy free wifi from your mobile device. Hi lovely viewers and welcome to this post. This tutorial is not something new on the internet, but I wonder why people are still finding it difficult to share/tether their Tunnel VPN network, as a result of too much request, I have no choice than to come up with this tutorial. I know that most of us are flexing with Simple Android Server, Psiphon Handler, OpenVPN, Tweakware, TunnelGureu, DroidVPN etc. To bypass the networks in order to have free access to the internet. Extending the internet connection of your Tunnel VPN from your smartphone to your PC without using any VPN on your PC is really cool. Today, I'm going to show you 4 different methods with 3 different apps to share or tether your Tunnel VPN connection either your phone is rooted or not. To share or tether your Tunnel VPN internet connection via Hotspot to PC or other device, this method known as - Manual Configuration. 6. On the proxy settings, select “Manual” (Tap on the “none” for the dropdown options to appear. 8. Leave the rest and tap on “Save”, then you can start enjoy your free browsing on the device you shared it to. 3. Run the installed PDANet+ app on your Android. Note that to share the connection with a PC, you have to download the pdanet.exe file for PC. 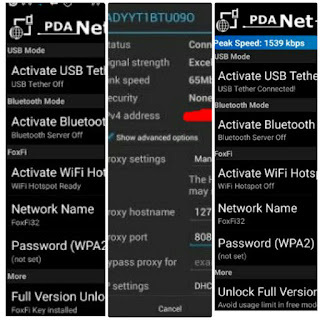 Iswat Tether Unlocker stop some tethering limitations on your Android device and allows you to connect all your tunnel VPNnetwork to any pc or other device using your portable Hotspot. That’s all, now you can extend your smartphone free browsing tweak to your PC and Other Devices. As you already know the Microsoft's latest OS Windows 8 and 8.1 comes with version 4.5 of .NET Framework which is required to run software programs developed using the same version of .NET. But there is one slight problem! Most of the existing software require version 3.5 of .NET Framework installed to be able to run. When you try to install .NET Framework 2.0 or 3.5 in Windows 8, it asks you to connect to Internet to download required installation files. For people who don't have Internet connection or who don't want to waste their Internet connection bandwidth in downloading .NET Framework 3.5 files from Internet, we shared a tutorial in past to install .NET Framework 3.5 offline in Windows 8 without Internet connection Install Microsoft .NET Framework 3.5 Offline in Windows 8 without Internet Connection The method mentioned in the above article works fine in all editions of Windows 8 but sometimes a few people face problems while installing .NET Framework 3.5 offline. Some people get error messages while executing the command. Most of the times these problems occur due to incorrect syntax in command or due to insufficient permissions. To solve all these problems today in this article, we are going to share a free, small and portable tool for all Windows 8 users. 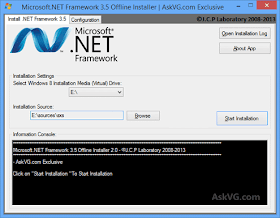 "Microsoft .NET Framework 3.5 Offline Installer " is a freeware created for Windows 8 which helps you in installing .NET Framework 3.5 in your system without any need of Internet connection. You just need to insert your Windows 8 setup disc in your CD/DVD drive and then select the correct drive letter in the freeware and then click on "Start Installation "button. That's it. It'll automatically execute the required command and will install .NET Framework 3.5 in Windows 8. If you don't have Windows 8 setup disc or if you don't want to install .NET Framework 3.5 from setup disc, you can use the setup folder of Windows 8 present on your hard drive. For example, if you copied Windows 8 setup files in E:\ drive of your hard disk, you can click on "Browse" button given in the freeware and then go to the Windows 8 setup folder. Select"sxs" folder present under "sources" folder and then click on "Install" button to install .NET Framework 3.5 in your system. This small piece of software also provides debugging options for advanced users. You can go to "Configuration " tab and enable the option to show installation process. It'll help you in finding the culprit in case you face any problem while installing .NET Framework 3.5 in Windows 8. Here you can watch this video below for more guide. This software will work in both 32-bit (x86) and 64-bit (x64) editions of Windows 8. You'll need to run the software with Administrator privileges by right-click on the program icon and select "Run as Administrator " option. Its required because the method only works if the user has Administrator privileges. If its difficult for you to download tryAlternative Link now. For more help added me ia whatsApp Messenger : 08067611897..
Dont forget to share with us on facebook,twitter,google plus and others social media.